Today I Wrote Nothing: No, YOU ate four burgers in two days. No, YOU ate four burgers in two days. I am officially on a Christmas Burger Rampage. These are the first four Wolf and I have tried, and I have to tell you, it is HARD WORK, all this research. We have to cut these in half, and then put them in our mouths. But we are doing it for YOU, our loved ones. 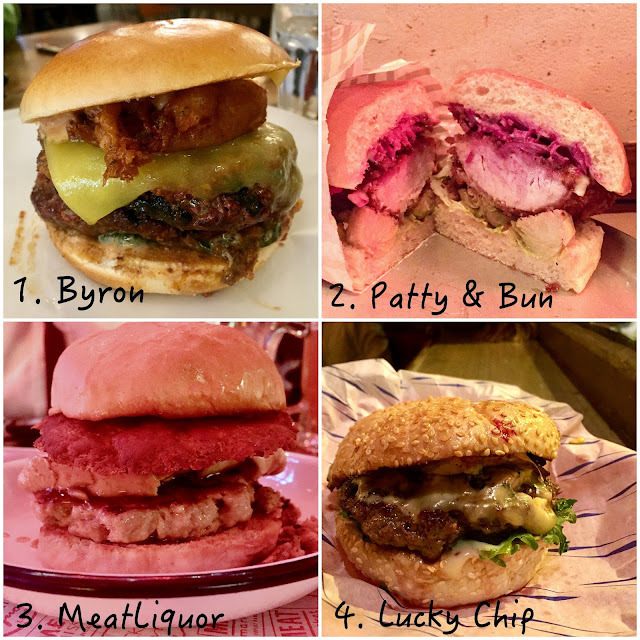 Because not all Christmas burgers are equal, and you need to save yourself for the best. We, on the other hand, enjoying flirting with heart disease. Live dangerously, live once. 2. Patty & Bun: THIS IS WHY THE HOLIDAY EXISTS. The photo above does NOT do this burger justice - it's the result of me trying to filter out the red lighting from the restaurant (speaking of, why do places use those?? It makes everything look awful!). It was hands down the juiciest turkey I think I've ever had. Like ever. It comes buttermilk fried, with sage and onion stuffing and bacon and sprouts and sausage relish and pickled red cabbage. It was the exact OPPOSITE of Byron's. It was ALL Christmas. And you wouldn't think brussels sprouts would work in a burger, would you? EXCEPT THEY DO AND I'M A FOOL FOR THINKING OTHERWISE. 3. MeatLiquor: WHAT THE HECK IS THAT SAUSAGE PATTY DOING? No amount of stuffing and gravy could save that grey squeaky slab. UGH. Next time I'll get their double cheeseburger with an onion ring and call it a day. 4. Lucky Chip: This was Alan's favourite of the bunch. It may have been mine, too, but I devoured it too quickly to tell. Really I should eat another one to double check. It was a lush deer patty with stilton cheese and a blueberry, blackberry, gin jam. I KNOW. No wonder MeatLiquor made me so mad afterward. Now if you'll excuse me, I have a guinea fowl dip bap with stuffing and cranberry sauce and gravy from The Duke's Head to try, and my home defibrillator isn't going to charge itself!